A new bill aimed at decriminalising abortion in Ireland will be debated by the Dáil tomorrow. People Before Profit TD Bríd Smith speaking at a press conference in Dublin today. A NEW BILL to be debated in the Dáil tomorrow would see the penalty for a woman in Ireland who procures an abortion reduced from 14 years in prison to a fine of €1. 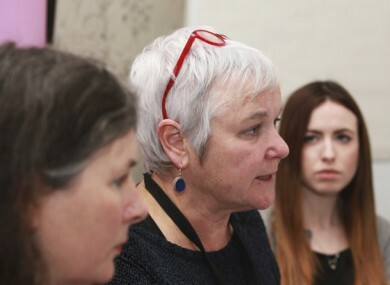 The bill has been tabled by People Before Profit TD Bríd Smith, who said the revelations about the mother and baby home in Tuam are “a blatant example of the Church and the State’s cruel and barbaric treatment of women and children.”. Today, women in Ireland are still treated as second class citizens and the barbaric sentence of 14 years imprisonment for accessing an abortion here is a shocking example of this. The Church and the State continue to dictate that women are not allowed to make their own choices as to whether to have children or not. “This is why we urgently need a referendum to Repeal the Eighth Amendment to the Constitution,” she said. Smith said it was time for the Church to “get out of our lives, our beds, our hospitals and our schools”. She said her bill, which will be debated by TDs in the Dáil tomorrow, is aimed at decriminalising abortion in Ireland. The debate follows further discussion at the Citizens’ Assembly over the weekend about repealing the Eighth amendment. It also comes as 50 activists from Rosa (for Reproductive Rights, against Oppression, Sexism & Austerity) begin a tour around the country on a bus to publicise the availability of abortion pills online through Women on Web. The bus started in University College Dublin this morning and will visit Waterford, Cork, Limerick, Galway and Kildare between now and Wednesday evening, finishing with a march to the Dáil at 5.30pm from the Garden of Remembrance in Dublin. Email “'Get out of our lives': Call for abortion penalty to be reduced to €1 fine”. Feedback on “'Get out of our lives': Call for abortion penalty to be reduced to €1 fine”.